~ The muscle in the walls of your heart contracts regularly. ~ Blood is pumped around your body as your heart muscle contracts. ~ Your heart is located in the middle of your chest. ~ Your rib cage protects your heart. ~ The right side of your heart is smaller than the left side. ~ Your heart has four chambers. ~ Your clenched fist is about the same size as your heart. ~ The left and right sides of the heart are separated. ~ De-oxygenated blood is received by the right hand side of your heart. 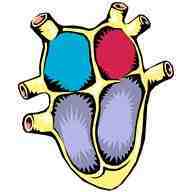 ~ Oxygenated blood is received by the left hand side of your heart. ~ Blood leaves your heart in arteries, which have thick walls. ~ Blood is returned to your heart in veins, which have thin walls. ~ Arteries and veins are called blood vessels. ~ Pulses can be felt from each beat on the left hand side of your heart. ~ Your heart beats an average of 70 beats per min (bpm). ~ At rest, it takes 6 seconds for blood to be pumped around your body and back to your heart. Now are you ready to take out Heart Quiz Challenge?